I introduce you to the wine region of Piedmont: the Langhe-Roero Monferrat. This region, like Val d’Orcia in Tuscany, has been listed in the Unesco World Heritage sites for its landscape shaped by the nature and the men. Here some of the most important Italian red wines are produced, like Barolo and Barbera. The wine region in Piedmont represents the perfect place to choose for a wine tour. When Rome was just a village of cottages on a hill, in Piedmont Etruscans and Celts met and influenced each other. Wine has been cultivated in Piedmont since Antiquity. Traces of Etruscan and Celtic languages can be found in the local Piedmontese dialect. Pliny the Elder (1st century AD) named the region one of the best for growing wine in the whole Roman Empire. Its native Nebbiolo grape variety is considered one of Italy’s best. Langhe-Roero and Monferrat are the hilly areas between Po river and the Ligurian part of the Apennine Mountains in the south of Piedmont. Vineyards have been present in the landscape for centuries, since Antiquity as Pollen from vine dating from the 5 century AD has shown. The charming rolling hills of Langhe-Roero and Monferrat merit a visit for wine tasting in combination with excellent food. But there is much more. The area has been reinventing itself for centuries, coming up with food inventions (including a world famous hazelnut-chocolate spread) continuously. Here you can experience how viticulture forms a landscape or – to be more precise – what the perfect landscape for viticulture looks like. Add the many stories about grape varieties, wines and wine-growers including the Italian king Vittorio Emanuele. Wine is an indispensable, integral element of Mediterranean cuisine and life. It accompanies and completes every dish creating conviviality and friendship. The family table is the centre of family life. One of the most charismatic chefs in Italy today, Antonino Cannavacciuolo Chef at Villa Crespi describes wine as a faithful companion in a journey of tastes, a friend that never dominates but follows your flow. The Langhe, the hilly area south and east of the Tanaro river is the original territory of the Nebbiolo grape variety which makes Barolo, Barbaresco and Nebbiolo wines. When Lucio Columella described a grape variety from northern Italy which served to make a wine with a taste of tar he was most likely speaking about Nebbiolo. Nebbiolo grapes mature late, often when the hills are already covered with mist, ‘nebbia‘ in Italian. Or the name is derived from the white covering on the mature Nebbiolo grapes. The first written evidence about its existence is from the beginning of the 14th century. 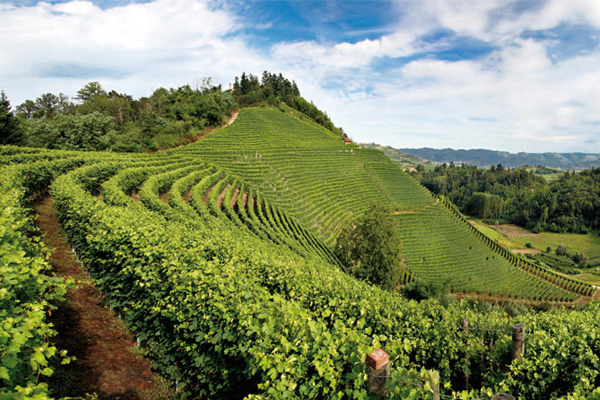 Now, you may wonder, what makes these Piemontese hillsides so special? Nebbiolo grapes are like a diva: expressive and demanding. They make for expressive wines, that have to age a certain time. Then add a high demand to soil quality and location: it has to be marly soil on a steep southward-facing hill. All these conditions are present in Langhe-Roero and Montferrat. No wonder outside Piedmont you won’t find Barolo of the same quality! Now let’s take a look at some more varieties and wines. Barolo is called “wine of kings” or “king of wines”. When Marquise Giulia Falletti of Barolo decided to make a wine modelled after the French Bordeaux the Barolo wine was born. The Savoy family fell in love with it, bought own vineyards in the region and royal fame was added to Barolo. Today Nebbiolo grapes for the production of Barolo are grown in 11 villages in the Langhe, all situated south-east of the town of Alba. Barolo production follows strict rules: aging of 2 years in barrels made from oak or chestnut wood, a limited amount of grapes to harvest, 13% of alcohol. Barbaresco was officially born in 1894 when a cooperative started producing it. Similar rules as with Barolo. Its Nebbiolo grapes are grown northeast of Alba on hills all 500 metres above sea level. Barbera has been growing in Langhe since the 17th century. First written evidence is from the 16th century. Typical for this wine is its versatility. Taste and scent change according to soil and climate. Barbera from Tanaros left bank – that is the Roero! – is ready to drink immediately while its right-bank version has to age some time, similar to Barolo and Barbaresco. Dolcetto has emerged around 1000 in Montferrat, Piedmont thus being indigenous to this territory. It is considered the most typical grape of Piedmont. Highly digestible due to its low acidic content Dolcetto was once considered a medicine! Dolcetto does not require long aging – it is ready the spring season following its harvest. There are 7 Dolcetto wines, all slightly different but all 7 share a scent reminding of sour cherry and a slightly sour taste. Arneis is typical for the lower hills of Montferrat or the left bank of Tanaro river, the Roero. First evidence stems from the 15th century. The high quality of this white wine has been discovered just recently. It is grown in sandy soil and develops an intense scent of exotic fruit. It is my recommendation for white wine lovers! Do visit a vineyard with a tour in the cellars. There are many stories hidden in each wine sort! Cycle the hills to experience them most intensively. Or fly above them in a balloon. Walk subterranean Alba to visit Roman excavations. Learn all about wine in the Wine museum of Barolo. Each autumn truffles scent allures gourmands into the region – join them! And what about the hills not suited for wine growing? Well, there are hazelnuts and the imaginative Piedmontese have invented delicious dishes based on it, but that is a different story.